Kazakhstan with its obsessive yearning for an international role in the global world prefer pompous events with no further obligations and commitments. Yet, there are always some remarkable things to take care of. One is a public adherence to human rights and values joining European organisations to associate themselves with civilisation and high standards. The Government of Kazakhstan has abruptly ceased its cooperation with OSCE in monitoring situation with ethnic minorities in the regions of the country. The reason remains unknown, but taking into consideration official statements about the importance of the issue for the authorities it would mean that everything about the relationship between different ethnic groups has reached its harmonious nirvana making the country able to teach others how to succeed. Or, probably, it is no more a priority for the government - to involve international players in its internal business towards progress. It would sound amusing that at the same time the news came about a new mausoleum called Pantheon is being under construction in Kazakhstan. Apparently, the tomb comes with a shortlist which undoubtedly is led by the incumbent President. It is not only Kazakhstan and Kyrgyzstan that disavow from some “services” of OSCE, but Tajikistan also denied to tolerate an independent European organisation mission in its country downgrading its presence requiring it to coordinate henceforth all its activity with the government. With Tajikistan’s continuous crackdown on the dissenters, media and opposition, the unimaginable level of corruption slightly shown by TV, the violent past, and the dependence on the international assistance and remittances from its labour migrants mostly left to Russia, it would hardly be able to present itself as a state committing to develop, to gain recognition as a trying, but not a state failing its citizens. If there is a space below acceptable standards then there will always be “decent” candidates striving to touch the bottom of opportunities. Who could imagine Kyrgyz authorities persecuting independent media, journalists, and opposition leaders again by a whim of the state leader under the scrutiny of global human rights watchdogs? Or silently supporting the Russian government’s risky ventures in Ukraine and Syria? Is it Kyrgyzstan that we are talking about? It was previously acceptable to see this country as a hope and example for Central Asia regimes highly appraised by the international community for its efforts to build democracy and commitments to the international obligations. This month started with criminal proceedings of the independent journalist Babakulov for his tireless attempts to draw everybody’s attention on the degrading ability of the state to secure peaceful and prospective living for all its ethnic minorities. Instead, he was ousted from his country and Fergana website was blocked again. June ended with a strikingly coordinated judicial blow against journalists masterminded by the Almazbek Atambayev, the creative and foul-mouthed politician, advantaging him to seize the property of the journalists and the lawyer. The highly anticipated visit of the High Commissioner for Human Rights to Uzbekistan gave hopes for the release of numerous political prisoners, journalists and human rights defenders. 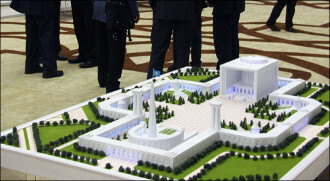 However, the pilgrimage of high UN officials to the Islam Karimov tomb in Samarkand cause mixed feelings on the ability of the international community to render the message to observe and promote the international obligations on human rights and freedoms. The UN diplomatic zeal is quite understandable in the circumstances of the overall neglect of human rights and freedoms in Central Asia. It is the power to change we doubt, however, not the meaning. UN Secretary General visited all five countries of Central Asia. His unprecedented speech at the event associated with the organisation, which bases its activity on security and military cooperation, is notable for its “curiosity” and a recognition of the increasing influence of China on anybody within its reach. However grotesque it may sound, but Mr Guterres’ press-conference in Kyrgyzstan was “soiled” by the unexpected (by the international audience of course) and flamboyant (as usual) expression of Kyrgyz President Atambayev about the journalists and human rights defenders in his country comparing them with “wastes.” Who would expect gentlemanlike manners when you have elections around the corner and your candidate is not favoured by the independent opinion and with a human rights defender as a presidential candidate, the increasing Russian pressure on Soviet-style reintegration, and the dying hopes to gain a popular support among the constituency tested revolutions and blood? It is not only the United Nations that care about achieving sustainable development goals in the region, but the World Bank Group can surprise too. Its unequivocal involvement in developing of cotton production in Uzbekistan is accompanied by allegations in ignoring of facts of forced labour. While it is very easy to imagine a turning of “the democratic island” into the authoritarian mess, it is evidently not so simple to modernise Kalashnikov into a pot. Uzbekistan expressing more and more openness and its readiness to participate actively in lives of its neighbours, but also to attract foreign investment with its huge industrial capability and voluminous market. It is still very difficult to believe the sincerity of the Uzbek government to turn down its creepy past and start a new life full of popular support and promising results. I would like to think that it started to acclaim a common sense and look into the future. Nevertheless, it is still an old Soviet machine modernised by Islam Karimov and it still crushes human lives and shows no mercy for those left behind without any hope for justice.